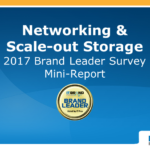 SAN DIEGO, CA—April 26, 2017—IT Brand Pulse, a trusted source for research, data and analysis about data center infrastructure, today announced the results of the recent IT brand leader survey covering Networking and Scale-out Storage products. In this year’s survey, Cisco secured Market Leader for Ethernet Core Switches (seventh straight year), along with Price, Performance, Reliability, Service & Support, and Innovation awards. HPE finished second as Market Leader, ahead of third-place Juniper. Nearly 70% of IT respondents chose Cisco as Market Leader for Ethernet Top of Rack Switches (fourth year in a row), in addition to Price, Performance, Reliability, Service & Support, and Innovation. Dell EMC came in as Market Leader runner-up, in front of Juniper. In the Servers for Software Defined Storage category, Cisco UCS repeated its 2016 Market Leader victory and captured four of the five remaining titles (Performance, Reliability, Service & Support, and Innovation). Dell, selected as Price Leader, followed behind Cisco in the Market voting, with HPE, third. Cisco regained the WAN Optimization Market leadership it lost in 2013 and also clinched Performance, Reliability, Service & Support, and Innovation. Second-place Market Leader (and Price) went to last year’s winner, Riverbed, with Citrix rounding out the number three position. For the third time, in as many brand surveys, Dell EMC headed up all six leader categories for Open Networking (Bare Metal) Switch: Market, Price, Performance, Reliability, Service & Support, and Innovation. HPE scored second all around, with Penguin Computing making its first appearance in the Market Leader top three. Dell EMC picked up the entire lot of Scale-Out Object Storage Appliance leadership honors—Market, Price, Performance, Reliability, Service & Support, and Innovation—for the fourth straight year. 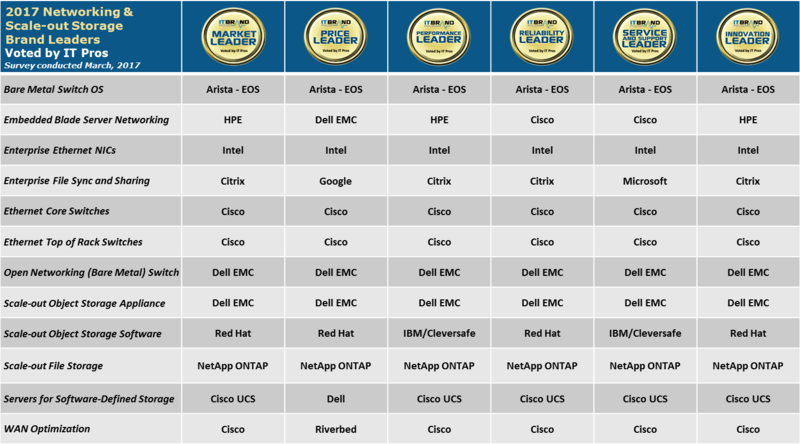 HDS and NetApp rounded out second and third, across-the-board, respectively. For the third consecutive year, IT professionals cast their votes to Citrix as Market Leader for Enterprise File Sync & Share. Though Citrix was also their preference in the Performance, Reliability, and Innovation categories, the Price Leader award again went to Google, along with Service & Support to Microsoft (next in line for Market Leader, before Dropbox). HPE made it five in a row with this year’s Market Leader results for Embedded Blade Server Networking and, once more, garnered Performance and Innovation titles. Cisco, the runner-up Market Leader, was recognized as Reliability and Service & Support leader; while Dell EMC walked off with Price. Intel, for the sixth straight year in Enterprise Ethernet NICs, outpaced its closest Market Leader rival (second-place Broadcom) and went on to collect Price, Performance, Reliability, Service & Support and Innovation. Cavium/QLogic took third. NetApp’s ONTAP data management software swept the 2017 Market, Price, Performance, Reliability, Service & Support and Innovation leader charts for Scale-Out File Storage, passing up two-time reigning Market Leader champ, EMC (now Dell EMC, which finished in the second slot). HPE was third. “IT leaders are pressured to harness today’s wealth of data and create new business opportunities in the digital era—all with limited time, skills, and budget. NetApp’s approach to data management helps customers unleash the full potential of their data on premises and in the cloud. We are honored to be recognized for our data management leadership,” said Brett Roscoe, vice president, Product, Solution and Services Marketing, NetApp. In the most crowded field for IT pro voters to select from in this year’s survey (fourteen vendor choices in Scale-Out Object Storage Software), Red Hat bested the Market Leader competition for the third time, and was handed Price, Reliability and Innovation awards. IBM/Cleversafe—which won the top prize in this category in 2016—earned Performance and Service & Support, staying ahead of third-place Scality for Market Leader. Arista EOS unseated Cumulus’ 2015 and 2016 hold on the Bare Metal Switch OS category to win big this year; delivering first as Market, Price, Performance, Reliability, Service & Support, and Innovation leader. Cumulus Networks was second, overall, with Big Switch in third.